In these days everyone lady is worried about their dresses because its an Eid time. Its a dream of every girl to look best on Eid festive. So the selection of dresses is always hectic. There are famous and reasonable Pakistani brands out there. And every brand launches their Eid collection like Gul Ahmed Festive Eid Collection , Alkaram Festive Collection , Junaid Jamshed Eid Collection, etc. One more famous name is Sana Safinaz Muzlin collection. Now It’s your choice to choose the best dress for eid and look good among the friends. 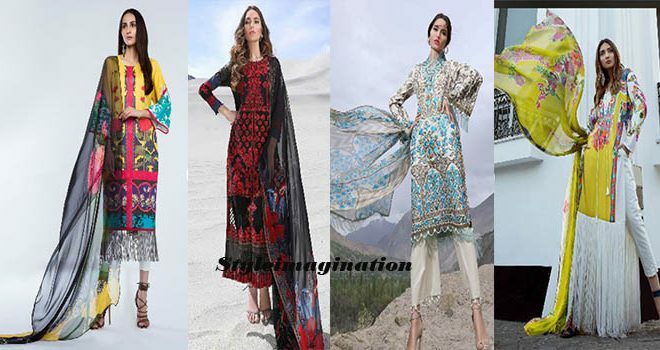 Sana Safinaz Muzlin collection is best for Eid ul Azha. Embroidery dresses looking very traditional and classic. Sana Safinaz is a famous Pakistani brand. The brand is renowned because of its versatile clothing and accessories. It sells ready to wear, haute couture and unstitched. Two close friends Sana Hashwani and Safinaz Muneer start this brand with the name of Sana Safinaz in Karachi, Pakistan. They partied their Silver Jubilee on completion of 25 years of their retailing history in 2014. Classic chintz embroidered front on gold paste print along with gold paste sleeves and back on lime green base matched with a blended chiffon dupatta and a cotton trouser. Beautiful chintz embroidered front on gold paste print and lawn gold paste shirt back. 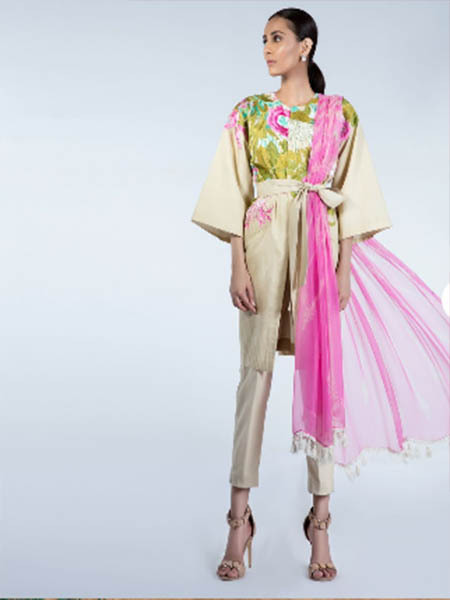 Along with lawn gold paste sleeves and back on beige base paired with a blended chiffon dupatta and a cotton trouser. Pretty traditionally done embroidery in shades of reds on front and Lawn Shirt Back. Along with gold paste sleeves and back and gold paste borders for front back and sleeves and a printed border strengthened with blended chiffon printed dupatta and a cotton trouser. Elegant classical done embroidery in shades of Greens on the front and separate Lawn Shirt Back. Along with gold paste sleeves and back and gold paste borders for the front, back, and sleeves. And a printed border accentuated with blended chiffon printed dupatta and a 2.5-meter cotton trouser. Refined Turkish designed embroidery in bright colors on the front and lawn gold paste shirt back. Shirt piece is looking so elegant and unique embroidery making it more beautiful. Along with gold paste sleeves and back accentuated with blended chiffon printed dupatta, a cotton trouser and Neck Line Embroidery on Organza. Delicate florets embroidery on shirt front along with cord embroidered and tilla embroidered borders and lawn gold paste shirt back. Paired with gold paste sleeves and back accentuated with blended chiffon printed dupatta and cotton trouser. Embroidered cord border on organza and embroidered tilla border making this outfit more attractive. Beautiful florets embroidery on shirt front along with cord embroidered and tilla embroidered borders and lawn gold paste shirt back. Paired with gold paste sleeves and back accentuated with blended chiffon printed dupatta and cotton trouser. Embroidered cord border on organza and embroidered tilla border making this outfit more charming. Sana Safinaz Muzlin Collection is so attractive, and it is best for eid. Russian inspired electric blue ethnic print is looking gorgeous. 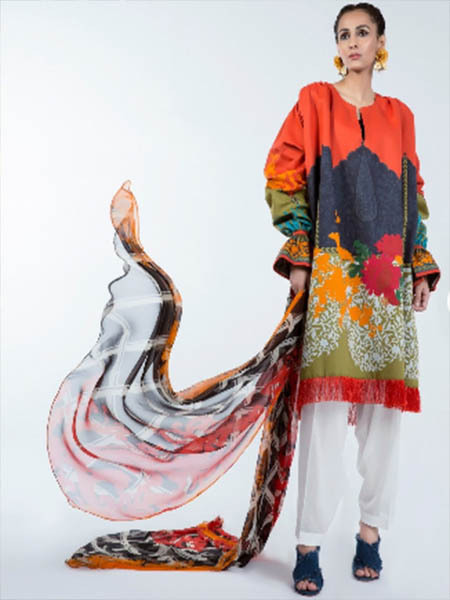 With color blocked Daman on lawn digital kameez on lawn fabric and digitally printed back with digital printed sleeves. Paired with complimentary bold floral lawn dupatta. Beautiful blue and cream color blocked kameez offset is looking very attractive. Multicolored Victorian floral patterns on lawn digital kameez with digital printed sleeves on lawn fabric. Paired with cream floral printed blend chiffon printed dupatta. Lime green and cream color Kameez is looking so fresh and beautiful. 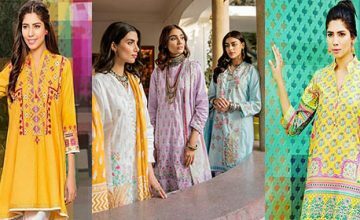 Blocked kameez offset with colorful Victorian floral patterns on lawn digital kameez with digital printed sleeves on lawn fabric. Paired with lime green floral printed blend chiffon printed dupatta. Something is fascinating about the simplicity of black and white color. Black with white bold Chinese digitally printed kameez with nice placement of sunflowers. And chines pottery with digital print sleeves on lawn fabric. Paired with bold silhouettes of chines flowers printed on blend chiffon printed dupatta. Acid yellow with black bold Chinese digital printed shirt with excellent placement of sunflowers. And chines pottery with digital print sleeves on lawn fabric. Paired with bold silhouettes of Chinese flowers printed on blend chiffon printed dupatta. Fuchsia pink and the lime green shirt is looking so attractive because of the fresh color. This design inspired by Mughal, digitally printed shirt offset by a pretty bunch of flowers with digitally printed sleeves on lawn fabric. Paired with the excellent lay outing of monochromatic bamboo grids on blend chiffon printed dupatta. Multicolors shirt inspired from Mughal. 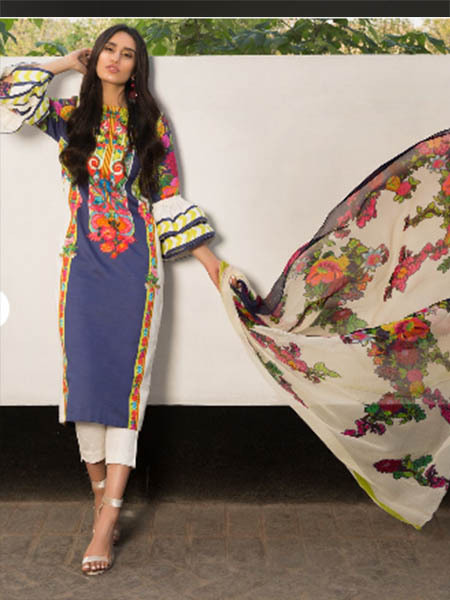 Digital printed kameez offset by a beautiful bunch of flowers with digitally printed sleeves on lawn fabric. Paired with the excellent lay outing of monochromatic bamboo grids on blend chiffon printed dupatta. Fusion of Chinese floral with monochrome geometric designs. Combined with red color blocked digital print kameez with digital print sleeves on lawn fabric. Compliment with chines flowers against black and red printed blend chiffon printed dupatta. The new lay outing of ornaments on beige self-printed lawn kameez with printed sleeves on lawn fabric. 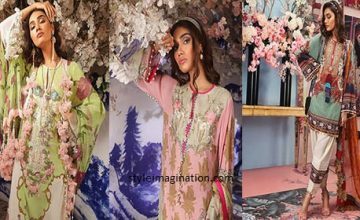 Combined with the Beautiful placement of iris and pansy silk thread embroidered floral design in shades of pinks, ferozi and green on organza. Paired with pink printed blend chiffon printed dupatta.